I realize that not all my readers reside in California and are able to enjoy current temperatures in the 60’s, 70’s or even 80’s. So, I want to share a tip for those aching to wear Spring attire in less-than-conducive weather. Full disclosure. Tights are my favorite article of transitional wear. Not only can and do I wear them with sandals – yes sandals! – but they come in all kinds of fun and crazy patterns. You may have been told that tights should not be worn with sandals. What do you think after checking out the muse to the left? 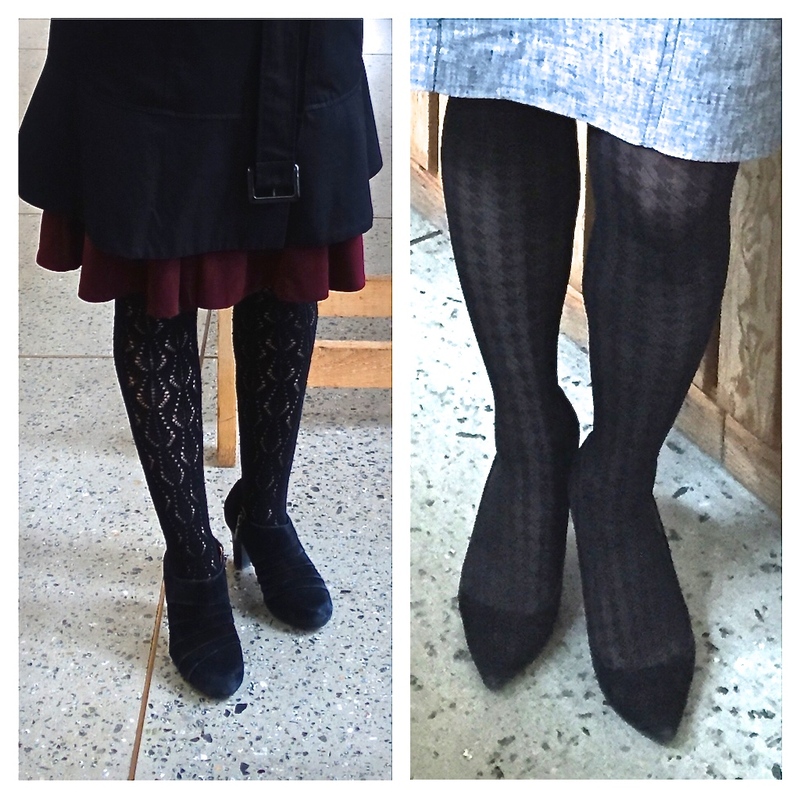 For wear with boots, patterned tights are awesome. 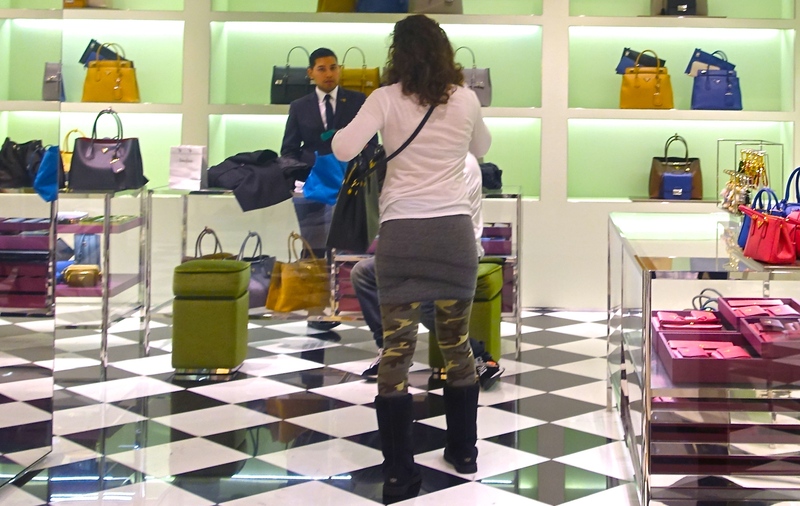 For the really cold days, cashmere tights (to the left) are a luxury. As well as more playful, casual ensembles. 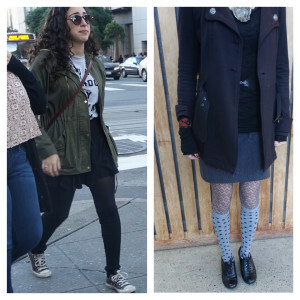 I generally pair a multi-colored or heavily textured outfit with monochromatic opaque tights, while simpler outfits allow for patterned tights (lace, polka dots or my faves, “tattoos”). Wearing tights with socks can also work, even if it is more of a youthful look than what I would call my personal style. At the same time, I can totally imagine myself donning this combination: fatigue patterned tights with a grey knit mini skirt. After all, there is a cheeky look for all ages. I think I might forego the Uggs, however. Even when the weather outside is bleak, dear reader, I want to give you hope that although Spring weather comes on its own schedule, we need not restrict ourselves entirely to last season’s clothes. On the train between Boston and New York City, I opted for patterned over opaque (yes two pairs!) Temperatures are in the 30’s. Best topic ever! I love, love, love tights. All kinds! What could be cuter or more fun than a great pair of tights to complement an otherwise boring outfit!